On Wednesday India joined the United States, Russia and China in possessing the capability to destroy a satellite with a missile. Globally, this means that there is another player in this field. Following India’s successful testing of A-SAT technology by the Defence Research and Development Organisation (DRDO), there are concerns regarding space debris and if there are enough technologies available for dealing with the growing debris in space. The missile is a land based platform. An American F-15 did shoot a satellite down in 1985 but that is also something coming from the earth into space in order to destroy a spacecraft. So far, all of the anti-satellite technology is land or air based missiles, Palmer adds. He also points out that there are no publicly known “weapons” in space that can disable or destroy an enemy’s satellite. To ensure that the outer space is usable by future generations, countries have to come together to ensure that activities taking place in space don’t create more space debris, opines Dr Rajeswari Pillai Rajagopalan, Head, Nuclear and Space Policy Initiative, Observer Research Foundation (ORF). She has suggested that there is a need for space situational awareness (SSA) system, which will create awareness about the space environment including tracking objects, debris, predicting collisions in orbit., and predicting re-entry of space objects into the atmosphere. So far, only three nations including the US which has the largest SSA network followed by Russia and the EU. There is no coverage of the southern hemisphere by the US’ SSA network and this gap can be covered by Russia and the emerging capabilities and networks in countries such as India, Japan and China. Theresa Hitchens, Senior Research Associate, Center for International and Security at Maryland (CISSM), says there is expected debris growth in Low Earth Orbit (LEO). In the next decade, there is expected to be a ten-fold increase in operational spacecraft, leading to an increase in space debris. According to the Outer Space Treaty of 1967, space junk, like working satellites, belongs to the country of origin — meaning that permission of the owner state would be required before it is removed. There are liability concerns too that if debris removal attempt has gone wrong could wind up with a large piece of debris or a dead satellite being flung into the path of an active satellite by mistake, points out Hitchens. 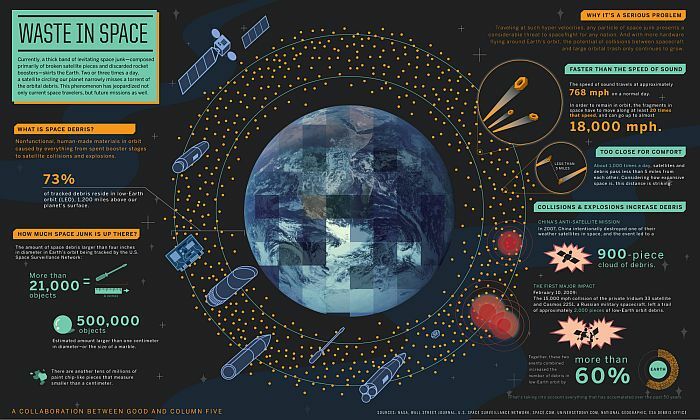 While ASAT technology is a missile system, other systems, such as the Remove DEBRIS programme, are actually capturing satellites and removing them from orbit. This is not a military system but a way of cleaning up space debris. KITE experiment of Japan which had failed initial tests in 2017 and continues being tested is based on tether technology. Under the European Union’s (EU) Remove Debris project technologies like harpoons, nets and drag sails are being tested. Astroscale, Singapore-based Company, owned by a Japanese has been contracted with mega-constellation operators for removing end-of-life satellites which is equivalent to space debris.